We touch our screens and trackpads all day long. Tapping, rubbing, and even caressing them, we move our fingers to drive software. But how do the designs of the interfaces we touch drive our fingers in return? What kinds of movements do those interfaces suggest, encourage, or demand? And how might these movements be changing the narratives we encounter every day? Touching Software explores such questions through the lens of contemporary film and TV. The first work in the series is Touching Software (House of Cards), a supercut of touch-based human-computer interactions from the popular Netflix show. The result illustrates not only how the show’s actors perform the manipulation of software, but also how software performs through the actors in return. Beyond these performances, the work asks viewers to observe the roles of software within contemporary stories. 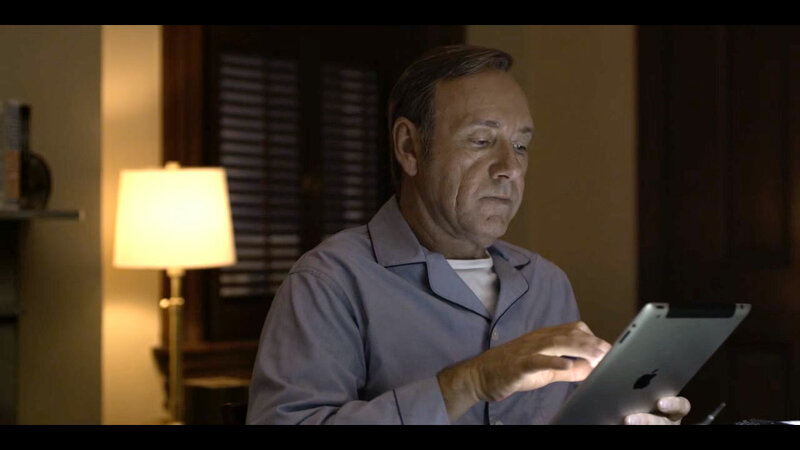 With House of Cards in particular, how does software affect its plot? What is the relationship between the show’s narratives of digital connection/ubiquity, and Netflix’ use of viewer tracking to guide how the characters develop, or how the show looks and sounds? Further, might such software stories be promoting the media’s / Silicon Valley’s overarching narrative of technology as neutral, as a simple facilitator of human connection? These are some of the questions I mean to pose with Touching Software. I’m currently narrowing my list of possible sources for two more supercuts. If you have suggestions, please let me know.